You will fly into table salt crystal and find out that chlorine ions are not the same. There are two naturally abundant isotopes. 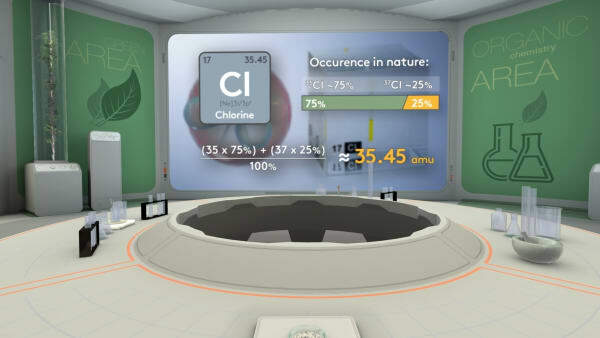 You will find out that atomic mass is counted as average of masses of naturally abundant isotopes. In the pe­ri­od­ic ta­ble, the atom­ic mass of el­e­ments gen­er­al­ly in­creas­es with the atom­ic num­ber, with a few ex­cep­tions. The main con­tri­bu­tion to the mass of any atom is made by heavy pro­tons and neu­trons, which the nu­cle­us of an atom con­sists of. Elec­trons do not count, they are too small. 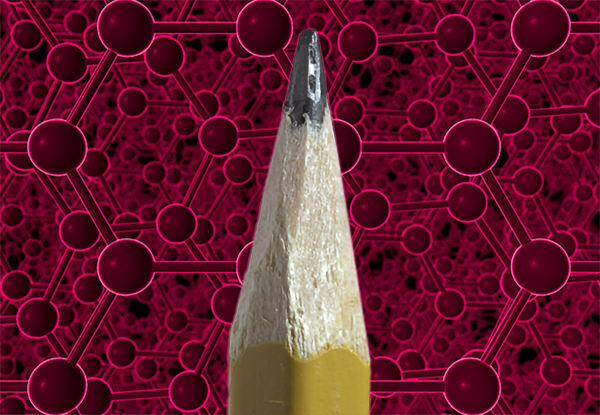 Since pro­tons and neu­trons have the same mass, ap­prox­i­mate­ly equal to 1 atom­ic mass unit or a.m.u., the atom­ic mass of an el­e­ment should be close to a whole num­ber. 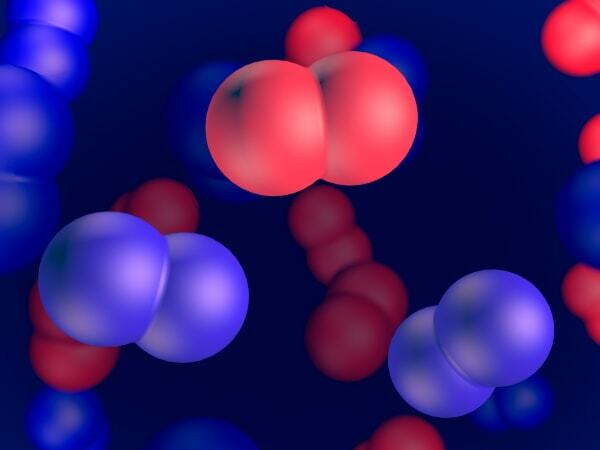 The mass of this chlo­rine atom is close to 35 a.m.u. 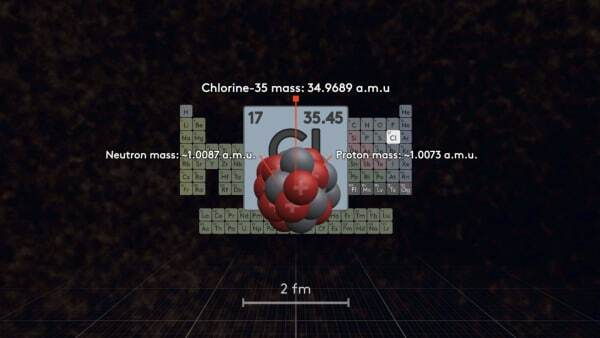 But look, in the pe­ri­od­ic ta­ble, the atom­ic mass of chlo­rine el­e­ment is near­ly 35 and a half! Why? Let's find out. To­day in our lab we have ta­ble salt. Sodi­um Chlo­ride. Look in­side. Do you see the sodi­um and chlo­rine? Сlick on one of the chlo­rine par­ti­cles. Its mass has ap­peared in the ta­ble and is ap­prox­i­mate­ly 35. Now click on an­oth­er chlo­rine par­ti­cle. Look, its mass is close to 37. 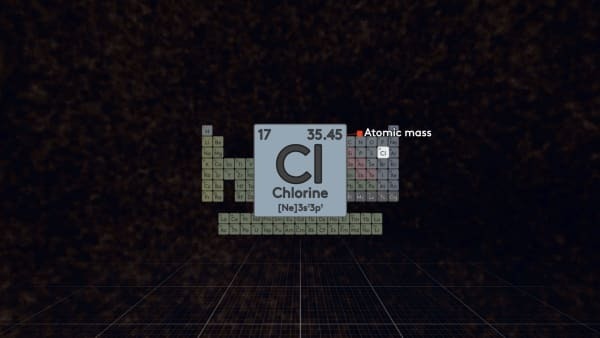 It is an­oth­er iso­tope of chlo­rine. We in­vite you to play, now. Try to se­lect the dif­fer­ent chlo­rine par­ti­cles. For each click, their mass­es will ap­pear in the ta­ble. When you click on 30 dif­fer­ent chlo­rine par­ti­cles, we cal­cu­late the atom­ic mass of the chlo­rine el­e­ment. Let's go! Your work is done, now look at the arith­metic av­er­age of atom­ic mass­es. It is ap­prox­i­mate­ly the same as the atom­ic mass of the chlo­rine el­e­ment in the Pe­ri­od­ic Ta­ble. 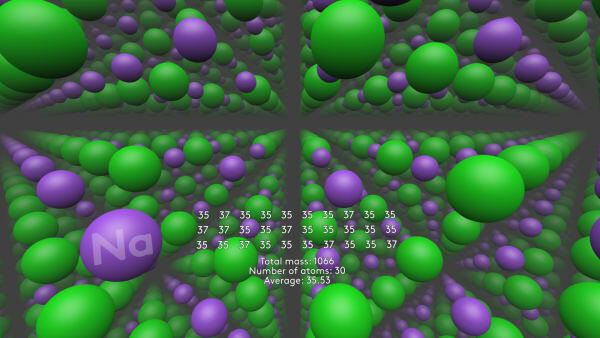 The av­er­age atom­ic mass would be more ac­cu­rate if you took into ac­count more atoms. Let's go to the Lab­o­ra­to­ry. Chlo­rine has two sta­ble iso­topes: chlo­rine-35 and chlo­rine-37. In na­ture, the abun­dance of chlo­rine-35 is close to 75%, and chlo­rine-37 - to 25%. So, we have near­ly 35 and a half. Bromine has two sta­ble iso­topes, bromine-79 and bromine-81. The nat­u­ral abun­dance of both iso­topes is close to 50%. What is the atom­ic mass of the el­e­ment bromine? Yes, the atom­ic mass of the bromine el­e­ment is close to 80. Learn that the mass of an atom is very close to the mass of its nu­cle­us, as elec­trons are very light. Find out that the mass of a pro­ton and the mass of a neu­tron are very close to 1 a.m.u., and thus the mass of an atom should be some­what close to a whole num­ber. Find out that some el­e­ments in the Pe­ri­od­ic Ta­ble have a mass which is not close to a whole num­ber (for ex­am­ple, chlo­rine). Learn­ing the prop­er­ties of ta­ble salt crys­tals. Learn­ing that chlo­rine found in na­ture has two sta­ble iso­topes with mass­es 35 and 37. 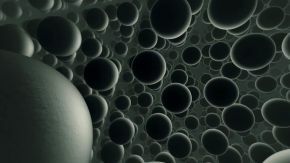 Learn that the atom­ic mass of an el­e­ment is cal­cu­lat­ed as an av­er­age mass of nat­u­ral­ly abun­dant iso­topes. 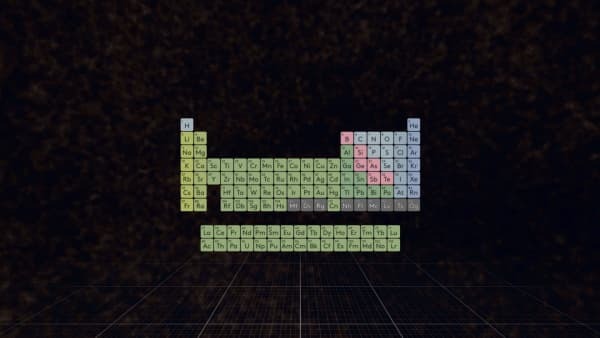 Be asked to cal­cu­late the atom­ic mass of bromine with nat­u­ral­ly abun­dant iso­topes 79Br and 81Br and abun­dance close to 50/50. The aim is to pro­vide stu­dents with an ex­am­ple of the av­er­age mass of real-life ob­jects. 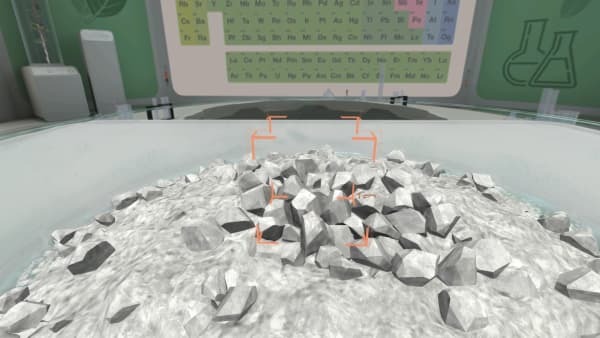 Ask stu­dents to weigh a va­ri­ety of ob­jects (for ex­am­ple, acrylic and glass beads of the same size, or met­al and plas­tic bolts and nuts of the same size) and cal­cu­late the av­er­age mass of an ob­ject. Then weigh them sep­a­rate­ly and com­pare re­sults with the av­er­age. 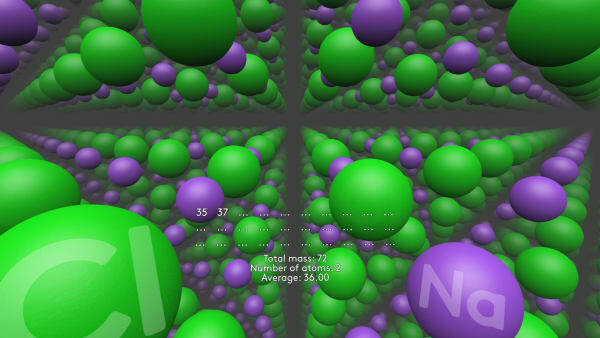 Mass spec­trom­e­try as a method of ‘weigh­ing’ atoms. Two sources pro­vid­ing num­bers for atom­ic mass that are not whole num­bers: iso­topic abun­dance and for heavy el­e­ments, the dif­fer­ence be­tween pro­ton mass and neu­tron mass. Real life ex­am­ples, when the av­er­age con­tra­dicts com­mon sense: the av­er­age num­ber of peo­ple in a house­hold (2.5), av­er­age pop­u­la­tion den­si­ty (frac­tions of peo­ple per square km), etc. More than 75% of all el­e­ments on Earth are a mix­ture of their iso­topes. 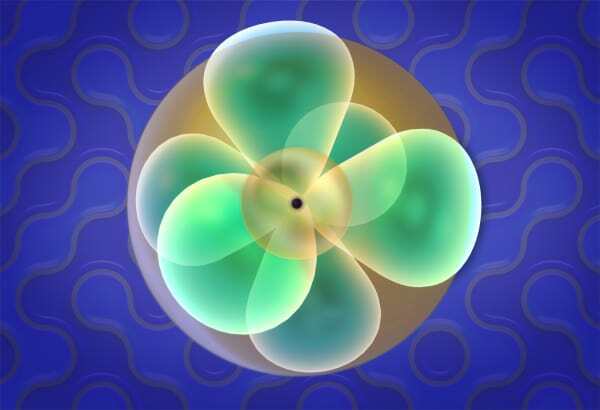 El­e­ments in the Pe­ri­od­ic Ta­ble were orig­i­nal­ly in or­der of their atom­ic weight be­cause sub­atom­ic par­ti­cles were not known at the time. 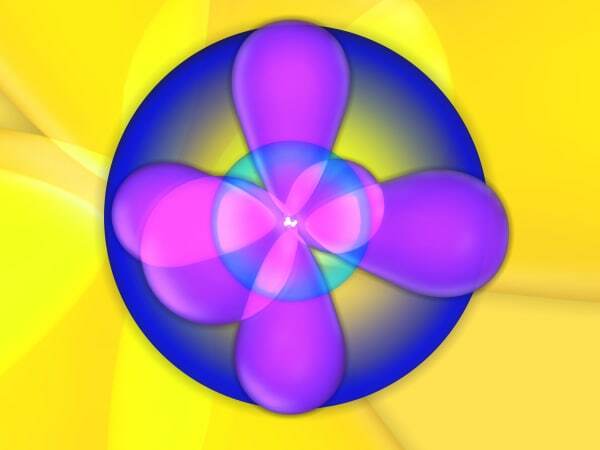 Why the atom­ic mass might not be close to a whole num­ber? 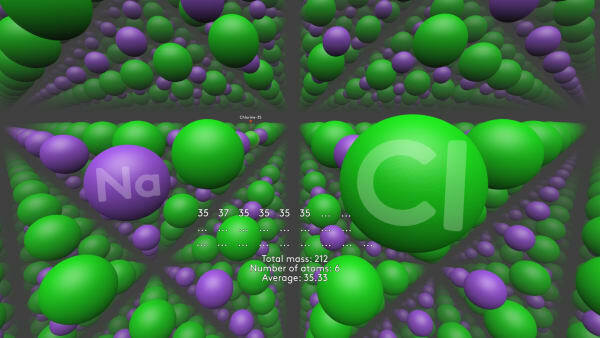 Why we don’t take into ac­count the mass of elec­trons when cal­cu­lat­ing atom­ic mass? Cal­cu­late the av­er­age mass of Cu, if cop­per has two nat­u­ral­ly abun­dant iso­topes 63Cu (69.17%) and 65Cu (30.83%). Com­pare the re­sult with the cop­per atom­ic mass in the Pe­ri­od­ic Ta­ble.